Preservation of land and water resources is an extremely important issue around the globe. As land development increases, the need for effective, affordable solutions is clear. In the United States, record-setting development of commercial, retail and large residential projects is propelling the development of better stormwater management technology to the forefront. Protecting our water resources and their ecology is a concern in nearly every community. Worldwide, water conservation efforts are pushing the industry to evolve, creating effective management technologies to capture runoff and turn it into a valuable resource. A larger problem looms for many local municipalities with drainage infrastructures encompassing a watershed area. These communities struggle with the increased runoff resulting from growing development levels. In some cases, water management districts must provide viable solutions that protect the environment while allowing the regulatory community to enhance the present infrastructure or to create regulations requiring onsite detention/retention systems to manage excess drainage. The infrastructure option is costly and is unlikely to yield a long-term workable solution to the problem. Onsite retention/detention is the most environmentally friendly and cost-effective approach. When water quantity is handled onsite, the developer can improve his or her options for development by advocating a subsurface stormwater management technology that can then offer more parking, building space or enhanced landscaping. While regulations are driving the development of new technology, the process is also working the other way around. Increasing community involvement and the need to treat stormwater onsite is a catalyst for many new regulations. Master planning for watersheds is almost commonplace. Communities are turning to onsite management programs that help to replicate the natural processes that took place before development. A growing trend is the onsite management of stormwater runoff where developers must make provisions for storing some water volume within their developments. Where to put the water, while optimizing available land for development, is a significant dilemma. When water quantity is handled onsite, the developer can improve his or her options for development by advocating a subsurface stormwater management technology that can then offer more parking, building space or enhanced landscaping. This solution benefits tenants, regulators, beautification committees, consumers and the developer while improving water handling and quality. Ponds have been used effectively for years to manage stormwater. Escalating land values, public safety, maintenance, aesthetics and the availability of new, cost-effective technology has brought the use of ponds into question. The high construction costs associated with large diameter pipe used for retention and detention has left some with the impression that subsurface stormwater management is expensive. Many stormwater management companies are working to develop economical and effective technologies that comply with regulations and environmental codes while allowing the developer to meet space and economic objectives. These new stormwater management technologies will lead the implementation of stormwater management programs worldwide. Economical, environmentally friendly solutions created by the industry allow regulatory agencies and developers to harmoniously exist and to improve our environment. Technology will solve the problem for new development applications, however the current status of our degrading water resources is primarily from existing developments. Strategies need to be developed to retrofit existing developments, bringing them up to the new standard. The quest for profitable development and protection of our natural resources has been a catalyst for looking below the surface to solve the stormwater management problem. 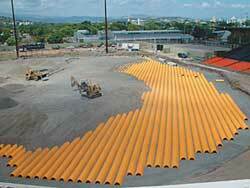 Depending on the site, subsurface treatment can provide the very best option for all parties. When the soil is used as a part of the stormwater treatment process, just as it is for residential wastewater treatment, a large percentage of contaminants can be removed naturally and effectively. In a study completed in 1997 by Thomas Schueler ("Comparable Pollutant Removal Capability of Stormwater Treatment Practices"), it was found that 89 percent of total suspended solids were removed using infiltration practices, as well as 99 percent of zinc, 98 percent of lead and 83 percent of nitrogen. When the soil is used as part of the stormwater treatment process, just as it is for residential wastewater treatment, a large percentage of contaminants can be removed naturally and effectively. The soil's inherent filtration capabilities are not new news. In Delaware, sand filters have been used for years for the treatment of stormwater runoff. These trusted sand filters provide the necessary treatment values for many municipalities around the Chesapeake Bay area, which is a highly sensitive watershed. Biofiltration swales are also an accepted method, using a combination of vegetation and soil to remove contaminates within stormwater runoff. The California Transportation Department (CalTrans) also has many ongoing monitoring sites along roadways where they are monitoring the treatment of vegetated and non-vegetated slopes to infiltration swales. Infiltration can provide many treatment benefits. It also provides another very important environmental consideration, which is groundwater recharge. Stormwater management plans are just beginning to take predevelopment infiltration rates on proposed developments into consideration in order to replicate nature's own process of groundwater recharge. As we continue to develop land and pave over permeable surface areas, we not only change the surface hydrology by increasing peak runoff flows, but we also dramatically change the subsurface hydrology. For those communities that rely on groundwater for their potable water supplies, recharge to this resource is imperative to sustaining community development. Without recharge the resource can be depleted. On the water quality side of the stormwater market, there are many companies trying to achieve some national verification of their technology. Many of these same companies are participating in the U. S. Environmental Protection Agency's (EPA) ETV (Environmental Technologies Verification) program, using the program as a vehicle toward attaining a national approval of their technologies. This program is generating a standard protocol for testing of the treatment values of the participating manufacturers in order to compare technologies "apples to apples." Similarly, the water quantity side of the stormwater market is also trying to follow nationally accepted standards, but the focus here is more on the structural integrity of the technologies. Amongst the manufactures of subsurface stormwater management technologies, pipe and concrete products have the only design and installation specifications written for them by both the American Association of State Highway and Transportation Officials (AASHTO) and American Society for Testing and Materials (ASTM International) organizations. Although pipe and concrete are viable systems, there are other more cost-effective subsurface solutions available to manage stormwater runoff. With one exception, these technologies and the companies that manufacture them do not follow any national accredited protocols for testing structural integrity. The exception is StormTech Inc., which recently introduced two different injection molded polypropylene chambers that were specifically designed and tested closely following AASHTO Load Resistance Factor Design (LRFD) methods for Earth Loads and HS-20 Live Loads. This extensive testing was executed to meet the needs of developers and communities where subsurface storage and treatment are critical. The company also contracted with independent experts to write the specifications in order to verify the structural integrity of StormTech chamber technology. Polypropylene is inherently resistant to environmental stress cracking, one of the challenges with high-density polyethylene products. The products are also injection molded within an ISO 9000-2000 certified facility, a form of manufacturing that allows the precise control of wall thickness and quality control procedures. Stormwater management plans are just beginning to take predevelopment infiltration rates on proposed developments into consideration in order to replicate nature's own process of groundwater recharge. In the case of the StormTech chambers, the treatment process can start with a biofiltration swale designed as an inlet to the chamber system where the chambers then are used as secondary treatment. In other designs, when vegetation is not needed as part of treatment, the chambers can utilize the soil to provide significant removal rates for several stormwater pollutants. As new technologies, methods and awareness develop, the next challenge becomes enforcement of the environmental regulations. All over the country, we are seeing penalties imposed as a result of lack of conformance to regulations, but there is still a shortage of funding and enforcement personnel in many areas. EPA establishes regulations and ordinances and requires local or regional authorities to implement the strategies needed to satisfy their requirements. Regional regulatory agencies are responsible for developing effective stormwater management programs within their respective watersheds. Regulatory agencies located in areas where water is a valuable resource to the economy lead the stormwater regulation management and enforcement movement. Certainly, there could be more stringent codes to improve the quality of stormwater practices, but balance between development and the cost of regulatory compliance is needed. The states outside of EPA direct management have begun to develop training programs on how the new Phase II requirements will affect them. For example, several "workshops" to help those who are impacted learn how to comply with the new regulations have been held in Massachusetts. Most of these states have the resources in place to review and monitor compliance, however development costs will go up. Because these controls are not required until 2003, smaller projects continue to be a main contributor to the stormwater problem. These small projects are more prevalent than larger five-acre developments that have historically been required to provide erosion and runoff quantity control. After 2003, a one-acre development that previously required no erosion control or stormwater management plan may need to incur some costs as part of development. The new regulations do not mean that development costs on these small sites will dramatically increase. Sometimes the controls needed are minor and the use of new technology will make the controls more cost effective. Municipal management is already in place for many of these developments as it is for the communities under Phase I. The increase in developments affected by regulation will drive regulatory agencies to create better tracking systems, most likely electronic methods. Undoubtedly, there will be more capital costs tied to regulatory monitoring. To assist, the federal government is making grants available for those who do not have the capital, human resources or the departmental infrastructure to execute effective programs. In these cases, EPA offers to manage the programs for them, something that is already happening in nine regions. Stormwater master planning is one way to address all of the needs and potential threats to watershed. However, implementation of these practices can be difficult and may not be economically feasible for many communities. Manufacturers who take the lead to develop economical solutions that address stormwater runoff issues can lead the industry and provide the regulatory community with solutions that meet EPA standards. In order for a given community to effectively enforce laws and regulations for the future they need the technological support of the stormwater management industry today. This article originally appeared in the November/December 2002 issue of Environmental Protection, Vol. 13, No. 10, p. 33.